This week I came across several links I know you will love and will give you a little respite from the craziness of life. I hope you enjoy! Motherlode: Camille is amazing. She is supremely creative and she shares such wonderful ideas backed by her inspiring photography. 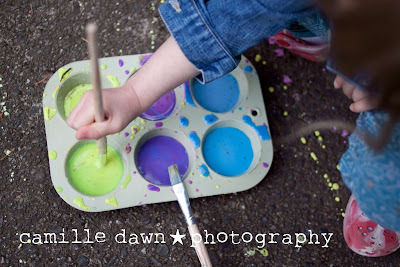 A few of the ideas that have inspired me are her pollock inspired pavement painting (yay for her muffin tin painters pallet-photo credit above) and her playdough flower garden idea which was featured on The Crafty Crow. Mad in Crafts: I found Mad via Dollar Store Crafts. and I can't. stop. looking through her posts! Her outer space themed big boy bedroom is so cute. I especially love the robot side table. Katie's Nesting Spot: love love love this family name tracing book. It's a great way to promote literacy, writing and family roles and socialization. Tumblr.com: oooohhhh Tumblr! Tumblr is a blogging platform that Camille of Motherlode introduced me to. Camille keeps all the links that inspire her by adding them to her tumblr site. She uses it like a social bookmarking site-but they are kept as photo thumbnails. Genious. You'll have to click over to see what I am talking about. I am officially in love with Tumblr! I have added one of my own and will be backlogging some of my fave NNFSP links as well as adding fresh links. Both activities are from the National Gallery of Art educational resource site, also their Kids Zone is incredible and great online fun for kids. Your child could spend an afternoon learning interactively about art! Paint Box:...A lot like the Paint program on your PC, but with an emphasis on technique, effects, and symetry. Your child can even print their masterpiece right from the site. Suitable for Preschool on up. Cake Maker: you can choose your cake color and shape and then add stamped design and write with virtual frosting. Also printable. Thanks for linking to dollar store crafts!! Glad you enjoy Madincrafts - isn't she great? Ok, I so want to figure out Tumblr but I don't "get it". Let me know when you have your site public, I'd love to see it. I signed up but the whole concept is not making sense to me ;-). I need help!! !